This is a post I started to write for the A-Z but dropped it in favour of writing about Joy. The photo was taken when I made my first glass of juice after returning from the Out of the Ordinary Festival where I built a Bio-Diversitree. The red colour comes from an unusual and very tasty apple that is not only red on the outside, but also on the inside! Maybe there was teeny bit of beetroot in it! I love freshly extracted juice. A glass of freshly extracted juice will kick-start your day just as well as a shot of espresso and you won’t get a mid-morning crash. What I’ve noticed since starting to juice is that I drink much less tea! If I don’t get my juice in the morning I need about 3 cups of strong tea to get started. With a juice, I sometimes don’t even finish 1 cup! I’ve been told eating an apple is just as effective. Apparently the juice kick-start is much healthier as it actually gives you energy, whereas the caffeine kick-start does just that: revs your heart rate. I also find a double juice serves me as a good breakfast substitute when in a rush or not in the eating mood. With a double juice I can go till lunchtime without eating. I don’t recommend this as a breakfast substitute; I do think we need a little protein and some good fibre first thing in the day. Perhaps if I tossed in a raw egg, yoghurt or some protein powder it would be better. I’ve tried adding seeds, but the juicer doesn’t grind, it extracts and seeds need to be ground up to be drunk. My hand-held mixer bit the dust when I dropped it and haven’t yet replaced it. Juice extractors can be expensive. I got lucky and picked up a used one for £14.0o. It’s big and chunky and a bit of a pain to clean, but what juice extractor isn’t a bit of a pain to clean? My favourite starter is apple-carrot-orange-ginger. Even though my extractor will take full-size fruit, I wash and quarter the apple and cut out the stem ends. This is where any chemicals will have collected. Otherwise, core, seeds and all go in the extractor. A couple of organic carrots, washed with tops cut off, a peeled orange (they do say you shouldn’t eat orange peel, and once I tried juicing with the peel left on and it tasted horrible so I always peel the orange and try to leave as much pulp as possible to go in the extractor.) I’m not too fussy about quantity of ingredients, it really depends on what’s in my fruit bowl. Usually there’s 1 medium size orange, 1 medium apple, and 3 or 4 small to medium carrots and about 1/2 inch slice of peeled ginger. If I want a really good buzz I’ll double up on apples and use more ginger. Other veggies which go in from time to time are celery (just a couple of small stalks or one large) and raw beetroot. I’m careful with this as raw beet juice can cause paralysis of the vocal chords – and we wouldn’t that, now would we! I’m sorry it’s taken me so long to get over here for a visit. Thanks for stopping by my blog when Q was the operative letter. 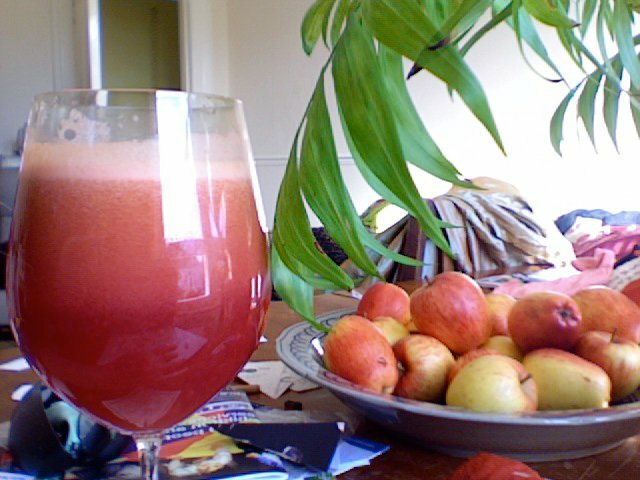 We bought a juicer (one of those cheaper Jack Lalanne models) and use it only occasionally. Now that fresh local fruit and veggies are becoming more readily available, I will have to dust it off and get it going again. Thanks for the reminder. No need to apologise for being slow to visit my blog – you’ve already been here! Do get going on the juicer. It’s well worth the effort!